Deputy speaker of the Abia State House of Assembly and the chairman, House Committee on Information, Rt. 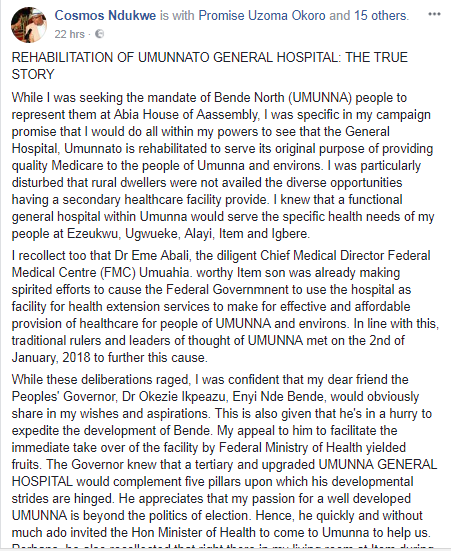 Hon.Cosmos Ndukwe took to his facebook page to share insightful rehabiliation story of Umunnato General Hospital. 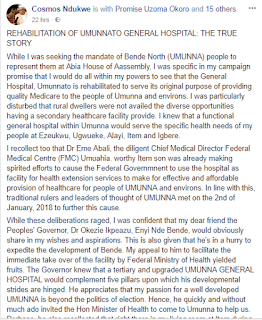 While I was seeking the mandate of Bende North (UMUNNA) people to represent them at Abia House of Assembly, I was specific in my campaign promise that I would do all within my powers to see that the General Hospital, Umunnato is rehabilitated to serve its original purpose of providing quality Medicare to the people of Umunna and environs. I was particularly disturbed that rural dwellers were not availed the diverse opportunities having a secondary healthcare facility provide. 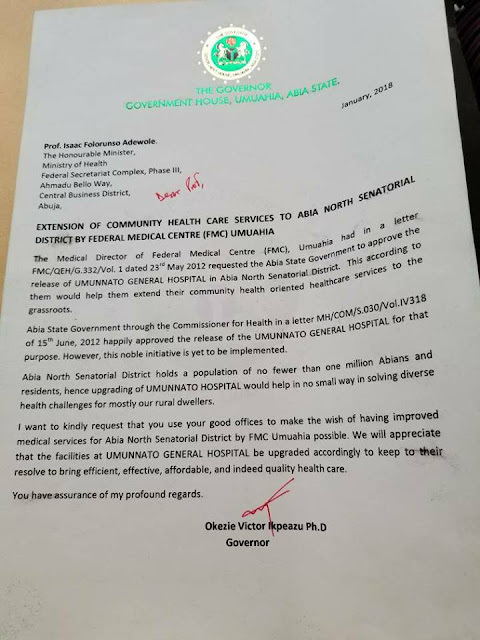 I knew that a functional general hospital within Umunna would serve the specific health needs of my people at Ezeukwu, Ugwueke, Alayi, Item and Igbere. I recollect too that Dr Eme Abali, the diligent Chief Medical Director Federal Medical Centre (FMC) Umuahia. 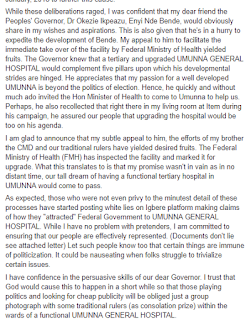 worthy Item son was already making spirited efforts to cause the Federal Governmnent to use the hospital as facility for health extension services to make for effective and affordable provision of healthcare for people of UMUNNA and environs. In line with this, traditional rulers and leaders of thought of UMUNNA met on the 2nd of January, 2018 to further this cause. While these deliberations raged, I was confident that my dear friend the Peoples' Governor, Dr Okezie Ikpeazu, Enyi Nde Bende, would obviously share in my wishes and aspirations. This is also given that he's in a hurry to expedite the development of Bende. 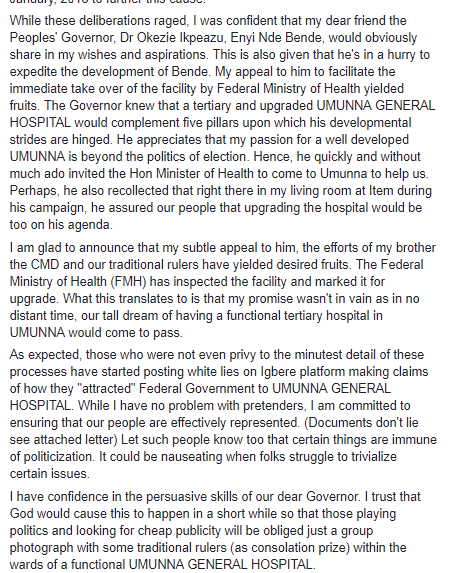 My appeal to him to facilitate the immediate take over of the facility by Federal Ministry of Health yielded fruits. 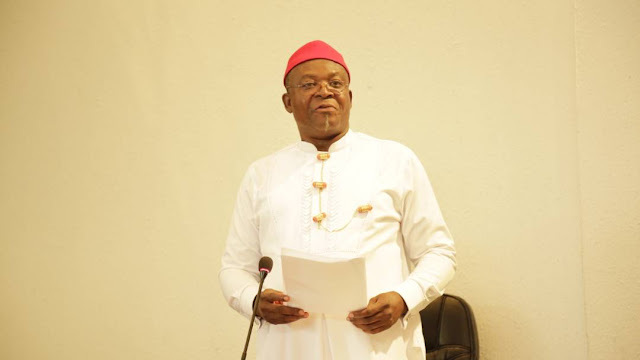 The Governor knew that a tertiary and upgraded UMUNNA GENERAL HOSPITAL would complement five pillars upon which his developmental strides are hinged. He appreciates that my passion for a well developed UMUNNA is beyond the politics of election. Hence, he quickly and without much ado invited the Hon Minister of Health to come to Umunna to help us. Perhaps, he also recollected that right there in my living room at Item during his campaign, he assured our people that upgrading the hospital would be too on his agenda. I am glad to announce that my subtle appeal to him, the efforts of my brother the CMD and our traditional rulers have yielded desired fruits. The Federal Ministry of Health (FMH) has inspected the facility and marked it for upgrade. 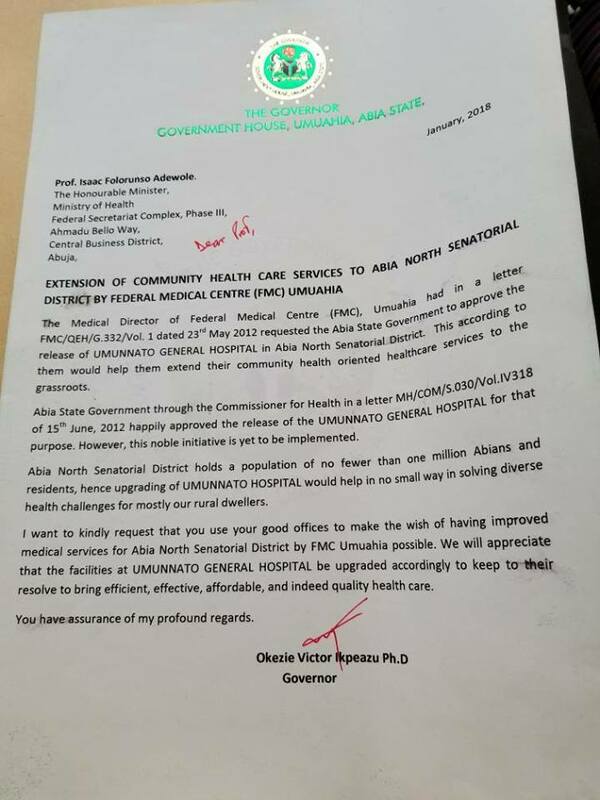 What this translates to is that my promise wasn't in vain as in no distant time, our tall dream of having a functional tertiary hospital in UMUNNA would come to pass. 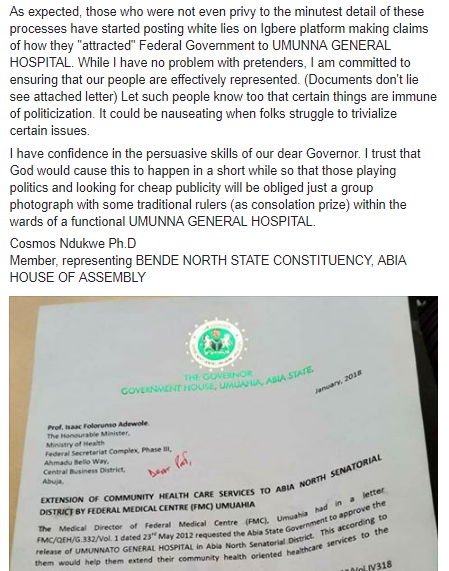 As expected, those who were not even privy to the minutest detail of these processes have started posting white lies on Igbere platform making claims of how they "attracted" Federal Government to UMUNNA GENERAL HOSPITAL. While I have no problem with pretenders, I am committed to ensuring that our people are effectively represented. (Documents don't lie see attached letter) Let such people know too that certain things are immune of politicization. It could be nauseating when folks struggle to trivialize certain issues. I have confidence in the persuasive skills of our dear Governor. I trust that God would cause this to happen in a short while so that those playing politics and looking for cheap publicity will be obliged just a group photograph with some traditional rulers (as consolation prize) within the wards of a functional UMUNNA GENERAL HOSPITAL. Member, representing BENDE NORTH STATE CONSTITUENCY, ABIA HOUSE OF ASSEMBLY.